Cardamom has a lovely sweet, warm aroma and flavor with a lemony layer and a eucalyptus-like kick. Used extensively in both Scandinavian and Indian cuisine, cardamom plays a starring role in both sweet and savory dishes. Indian cooking features cardamom in curries, garam masala, kulfi (Indian ice cream) and milk puddings. In Scandinavian cuisine, you’ll find cardamom in everything from pickles and herring to sweet cakes and Aquavit. The cardamom-infused coffee gahwa is a symbol of Arab hospitality. India grows most of the world’s cardamom, using half of the crop domestically. Cardamom must be hand-harvested, making it a relatively expensive spice. Luckily, it has a wonderful one-of-a-kind flavor and you don’t need to use much. The most cardamom is the green type; the less common black cardamoms have a coarser flavor and are usually only used in certain slow-cooked Indian dishes. If a recipe simply calls for “cardamom,” you’ll want to use green ones. While cardamom is available ground, for superior flavor and aroma, you’ll want to use the whole pods. Not only will you get excellent flavor, you’ll enjoy the heavenly aroma fresh pods provide. Lightly smash the pods or simply pick them apart and dump out the little seeds, which range in color from white to brown to black. For a flavor explosion, lightly pan-fry the seeds, dry or with a bit of oil, before you add them to a recipe. 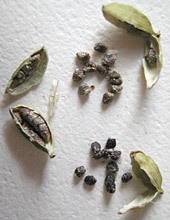 Whole cardamom pods are sage green in color; the seeds inside vary from medium brown to black. Cardamom is thought to have aphrodisiac effects, and, like caraway and aniseed, it’s a wonderful breath sweetener and helps eradicate garlic or alcohol breath. This entry was posted on Sunday, September 23rd, 2007 at 5:59 am	and is filed under Encylopedia, Herbs & Spices. You can follow any responses to this entry through the RSS 2.0 feed. You can leave a response, or trackback from your own site.